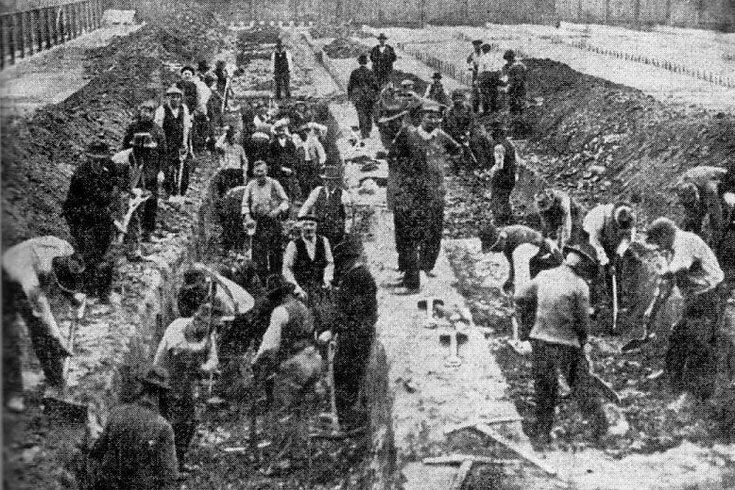 Men dig a mass grave in Philadelphia to bury victims of influenza in this photo from a newspaper clipping. September 28, 1918 was to go down as a great day in Philadelphia. Some 10,000 people were expected to watch the latest Liberty Loan parade – a patriotic spectacle designed to boost public financing for World War I. 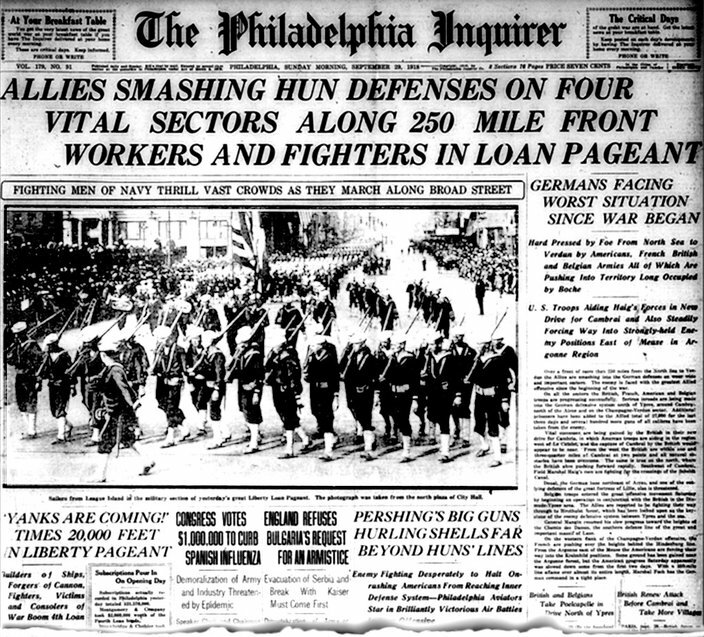 But amid growing excitement that the war was nearing an end, 200,000 people flooded Center City, loudly cheering as thousands of military personnel, industry workers, relief workers, scouts and veterans marched down Broad Street. That so many people came out astounded the local press, which did not hold back any praise in its coverage. The Philadelphia Inquirer lauded the parade for its pageantry and the enthusiasm of its onlookers, often in flowery prose. The Evening Bulletin, published later that afternoon, was more succinct but no less laudatory in its parade coverage. “This is a great day in Philadelphia,” its front page story began. But tucked deep inside the newspaper was a story about Thomas Harlacker, a 30-year-old city policeman who was one of influenza’s latest local victims. The account, which noted 118 new cases of the disease in the city in the last day, carried a warning that, 100 years later, reads prescient. If only health officials had followed their own advice. The Philadelphia Inquirer heaped all sorts of praise on the Liberty Loan parade, running a rare photo on the front page. But buried inside were stories detailing the rising influenza threat. Officials went ahead with the Liberty Loan parade in the face of an influenza epidemic that already had ravaged New England and was gaining traction at the Philadelphia Navy Yard and elsewhere in the city. PhillyVoice pored through dozens of archived newspapers from The Philadelphia Inquirer, The Evening Bulletin and The Public Ledger, searching for anecdotes that present a fresh take on a well-told story. It proved to be a grave mistake. The parade became an opportunity for mass infection. 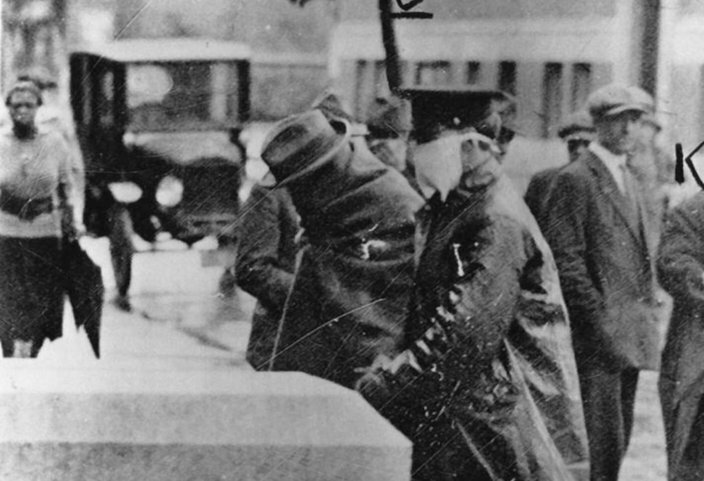 Within days, influenza had become so widespread that Philadelphia and state officials essentially shuttered the city. By the third week of October influenza, or "the grippe" as it was called by many, had afflicted tens of thousands of people and claimed the lives of more than 4,500 Philadelphians. Few American cities were hit harder. The influenza epidemic had reached Philly in early September when a Navy ship from Boston arrived at the Navy Yard. By the Liberty Loan parade, 525 people had come down with the illness. Seventy had died. Still, the so-called “Spanish Flu” had yet to instill the fear that it would just weeks later, when many people were too afraid to leave their homes. Krusen, director of the Department of Health and Charities, assured the public that the flu would not spread beyond the military camps. And the press downplayed its severity. World War I – and the upcoming bond drive – was of far greater concern, dominating headlines and the public consciousness. Though the war was drawing to a close, the city had been tasked with raising $259 million for the Philadelphia boys fighting in Europe. City officials needed the parade to proceed. 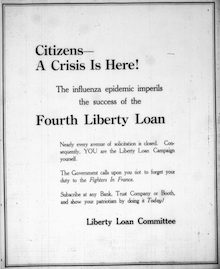 A full-page ad in The Philadelphia Inquirer urges residents to purchase Liberty Loans – despite the influenza epidemic afflicting the city. Just five days later, hundreds of new cases and dozens of deaths were being recorded each day – and those numbers would skyrocket in the weeks to come. City officials ordered all schools, theaters and churches closed indefinitely. And then the bars, pool rooms and dance halls. Hotels, barbershops, restaurants and lunch counters were left open. But their employees were required to cease work upon the first sign of the flu. Funerals only could be attended by adult family members and could not be held in a church or public space. And all public gatherings – like the Liberty Loan parade that had occurred just days earlier – were prohibited. Such drastic action – similar measures were considered or adopted in other nearby cities – were met with considerable skepticism in Philadelphia. The Inquirer led the charge, accusing city officials of going daft. The closing of saloons sent hundreds of Philadelphians to Camden, which shuttered its own bars two days later, in part to discourage thousands of people from bringing more influenza across the river. At another point, thieves broke into a wholesale liquor establishment in Center City, decorating the place with signs ridiculing the city’s bone-dry order. Yet, not everyone opposed the stringent restrictions. Jules E. Mastbaum, the president of the Stanley Company, which controlled many of the leading motion picture theaters, was emphatic regarding the closings. 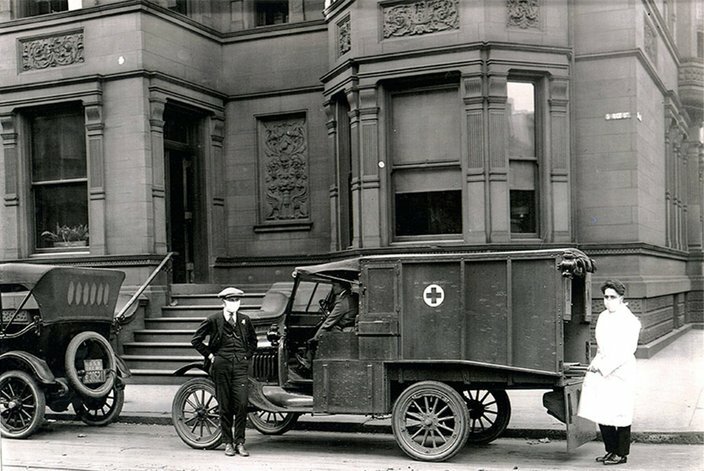 Men wearing gauze masks are seen in Philadelphia with a Red Cross truck. At the request of the U.S. surgeon general, the American Red Cross took over efforts to address the shortage of nurses in Philadelphia and other cities to care for influenza patients. Meanwhile, the city’s death toll continued to rise. Sharply. By the time the epidemic concluded several weeks later, more than 12,000 deaths had been recorded. At its height, 759 people died on a single day. Bodies piled up so fast that Philadelphia's only morgue, at 13th and Wood streets in the heart of the city, contained several hundred corpses – despite a capacity for just 36. Bodies were stacked three and four deep, covered only by dirty and blood-stained sheets. Most were unembalmed and not stored on ice. The surrounding region – particularly Camden, Chester and Gloucester – also was hit hard, as the disease proved far more severe than previous influenza outbreaks. Victims sometimes died within hours of showing symptoms. They coughed up blood from their lungs and bled from their noses, ears and eyes – symptoms far more severe than the aches and cyanosis that typically accompanied the flu. Entire families fell victim at once. In Camden, Robert J. Nelson, an electrician, fell ill after a week spent caring for 10 others in his house, including his mother and seven children. Similar stories played out across the region. Some people died without ever seeing a doctor or a nurse. And hundreds of children were orphaned after their parents perished. Hospitals filled so quickly that makeshift “emergency hospitals” popped up across the city and the region. Beds were set up in an armory, Republican club and several Catholic parishes in Philadelphia. Students at Bryn Mawr College scrubbed floors and cleaned windows to open the old Lancaster Inn for patients. In Gloucester City, the former Thompson Hotel was reopened as a hospital by the Pusey and Jones Shipbuilding Co.
As the influenza epidemic worsened, Philadelphia officials ordered all schools, theatres and churches closed on Oct. 3, 1918. The decision thrust the flu epidemic into the public consciousness. Doctors and nurses were of such demand that they worked around the clock, forgoing sleep and sometimes falling ill themselves. Dr. Frank O. Stem, of Camden, ignored a court summons because he had so many urgent flu patients – and then fell sick himself. By October 5, 40 nurses at Philadelphia Hospital had broken down from overwork, prompting an appeal for voluntary nurses. Six days later, five nurses there had died after refusing to cease their care of some 1,200 flu-ridden patients. "No soldier on the field of war battle could be any more courageous," Superintendent William G. McAllister told the Evening Public Ledger. "Nor are the nurses on the front one whit more heroines than these girls." “Women were crying because they could find no one to go to their homes to attend their children and children were crying because they could get no one to see their sick parents." – Report in the Inquirer. Additionally, the ranks of doctors and nurses were decimated by the ongoing war, with more than 25 percent sent to assist in the war. Nursing students were thrust into care. In some cases, volunteers shared that responsibility. Conditions became so dire that nurses occasionally were kidnapped on their way home. One man pulled a nurse into a Philadelphia taxicab, offering her any amount of money to treat his ailing wife. “Women were crying because they could find no one to go to their homes to attend their children and children were crying because they could get no one to see their sick parents,” the newspaper reported. The epidemic devastated the workforce. At one point, some 2,000 Philadelphia transportation workers called out sick. So many Bell Telephone Company employees fell ill that the company restricted its lines for emergency calls only. 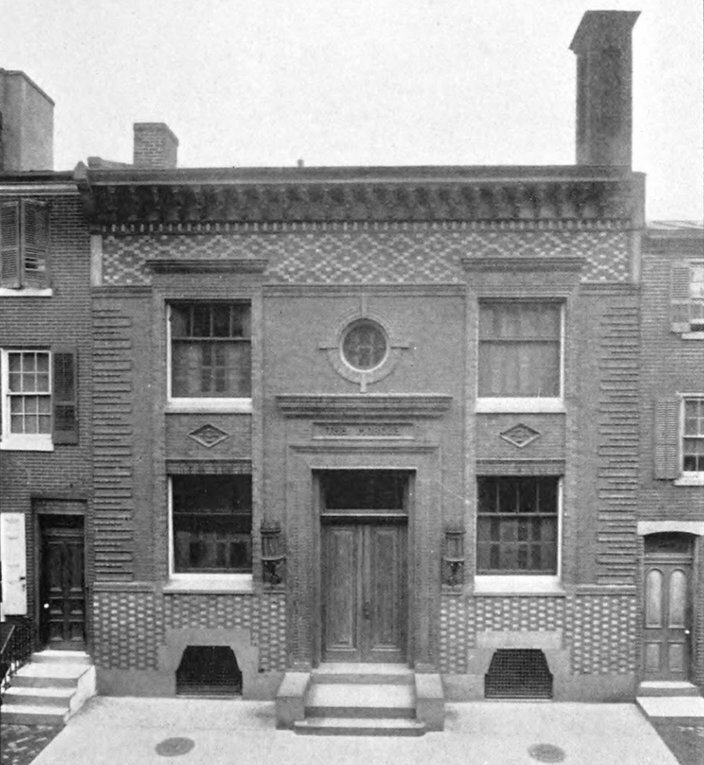 The city morgue, seen when it opened in 1895, was located on Wood Street, above 13th Street. As the epidemic heightened, people perished so quickly that the city’s undertakers could not keep up. More than 1,000 bodies were awaiting burial by Oct. 12, adding yet another health concern. Many bodies remained inside city homes for days at a time, because family members could not find undertakers or were too ill to take action. Bodies spilled out of the city’s morgue, prompting Commonwealth Brewing Company to offer its cold storage plant as a temporary facility for 500 bodies. Due to the undertaker shortage, hundreds of city laborers were tasked with digging out graves and constructing coffins. Prisoners were ordered to assist them. And others, including Catholic priests and seminary students, picked up shovels, too. "There is a pressing need for gravediggers," Coroner William R. Knight Jr. told the Evening Public Ledger. "And to relieve the situation and eliminate the menace of the bodies hundreds of loyal citizens ought to step forward today and serve as grave-diggers in the city cemeteries." Families began arranging temporary burials until a permanent burial could be obtained. At one point, the Rev. Dr. Joseph Corrigan, the director of Catholic Charities, led a convoy that collected bodies throughout the city. Rabbi I. Rosenfeld, of the Rumanian Congregation in South Philly, was among those who could not find an undertaker. He instead opted to bury his son, Jack, on his own, knowing the body otherwise would decompose quickly. With the help of a friend, Rosenfeld built his own casket and hired a wagon to cart his son’s body to Mt. Carmel Cemetery in Frankford. There, Rosenfeld helped lower his son, a senior at South Philadelphia High School, into the grave. Despite the shortage, some undertakers came under scrutiny when they started upcharging families. One undertaker reportedly commanded $500 for a burial – $350 more than the standard funeral charge. Others auctioned off pine boxes to the highest bidders. But undertakers were not the only ones looking to profit off the epidemic. The price of oranges – commonly recommended by doctors – increased from 40 cents to $1.50 per dozen. The flu brought out a few cons, too. A well-dressed man posed as a doctor for several days, charging hefty fees for so-called influenza cures. But the prescribed medication was actually candy. Source/Special Collections Research Center. Temple University Libraries. Philadelphia, Pa.
A Philadelphia police officer escorts an influenza victim to a hospital. Police were on the front lines of the 1918 epidemic, with dispensaries operating in downtown police stations and patrolmen volunteering as hospital orderlies during their off hours. Many officers contracted the disease and died. The disease itself had an unique characteristic that has befuddled medical researchers for the last century. Young adults were unusually susceptible to death. People between 15 and 34 years old were 20 times more likely to die than during previous influenza outbreaks, according to the Centers for Disease Control and Prevention. Equally baffling, people over 65 accounted for less than 1 percent of all flu-related deaths. Researchers since have reconstructed the 1918 virus – an H1N1 avian strain – but the properties that made it so lethal mostly remain a mystery. So does its origin. One theory surmises it first appeared in Haskell County, Kansas in January 1918 before spreading to a nearby Army base, and, eventually, the world. The first of three influenza waves hit during March 1918, but the second wave proved particularly virulent as the mutated virus spread rapidly across the United States and the battlefields of Europe. By the time the third wave concluded in 1919, the flu had killed 670,000 Americans – more than died in World War I. Anywhere from 50 million to 100 million people died worldwide, making the pandemic the deadliest in history. Dr. Thomas Fekete, a Temple Health infectious disease expert, called the pandemic a “classic, perfect storm,” composed of various factors – a particularly aggressive virus, susceptible immune systems, poor public policies, world war and extensive poverty. At the time, doctors instructed patients to rest in bed, eat well, get fresh air and use Dover’s powder – a pain reliever no longer in use. To guard against infection, a mild antiseptic was recommended to keep the mouth and nose clean. Unlike most influenza viruses, which normally only impact the nose and throat, the 1918 virus also attacked the lungs. That made viral and bacterial pneumonias common and, in turn, increased the death toll. 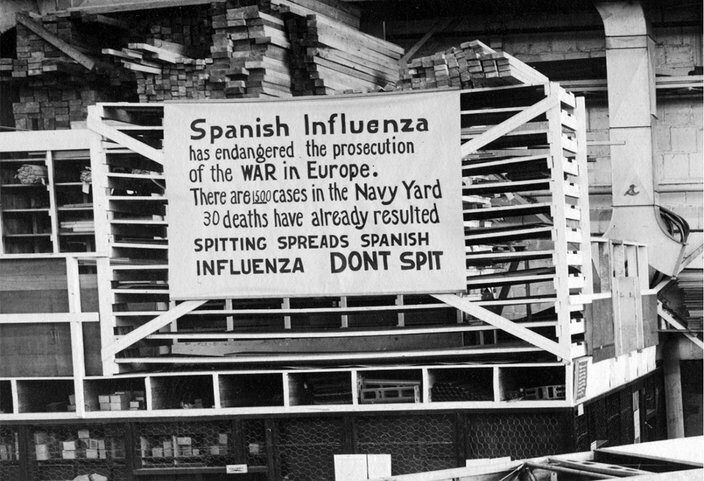 In this October 19, 1918 photo, a sign mounted at the Naval Aircraft Factory in Philadelphia warns that Spanish influenza is extremely active at the Navy Yard and in the factory. The epidemic spread quickly among the sailors there and spread to civilians in the city. But doctors had not yet discovered antibiotics, which would have fought bacterial infections common with influenza. And the first flu vaccine was decades away. Plus, doctors did not fully recognize the importance of quick diagnoses, Fekete said. That would have prompted greater isolation and inhibited the virus from spreading. City officials had not acted swiftly enough. For too long, the press underestimated the threat posed by influenza. And hospitals were unprepared. As the epidemic raged on – and the public finally grasped the severity of the issue – Philadelphia residents took greater precautions to protect themselves. Thousands of men began walking to work, hoping to avoid – and relieve – overcrowded trolley cars where the flu spread easily. In South Philadelphia, sanitary squads of women went from house to house, cleaning homes where influenza had been the most severe. Carrying milk bottles filled with hot water, they scrubbed surfaces with soap and burned any paper or trash they encountered. At the Navy Yard, where influenza hit particularly hard, 25,000 gauze face masks were distributed to military personnel, though their effectiveness is debated. City police began arresting anyone caught spitting on sidewalks or in public places, a habit that U.S. Surgeon General Rupert Blue said carelessly spread the disease. Violators faced a $1 fine. Additionally, the Bureau of Street Cleaning began flushing the city’s streets with water, hoping to clear them of germs. 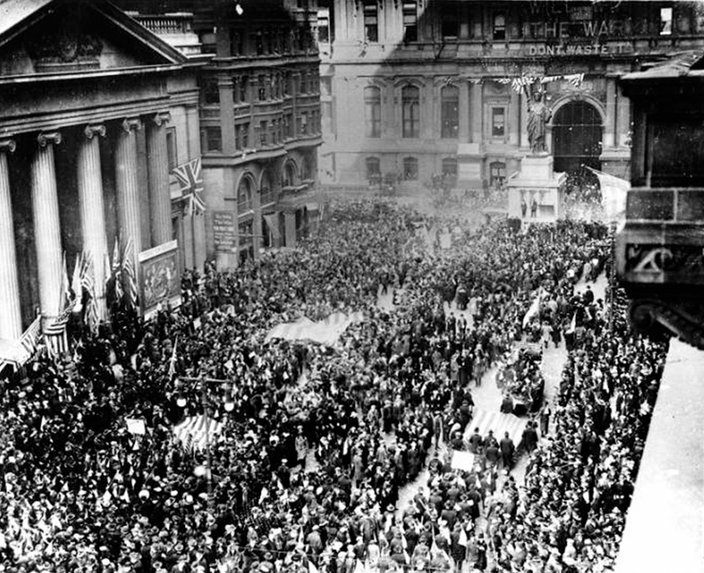 When big news came of the armistice to end World War I, a roaring throng jammed South Penn Square in front of the Liberty Statue at Philadelphia City Hall. But the damage had been done. The flu ran rampant in Philadelphia for weeks, claiming nearly 1 percent of the city’s population. By mid-November, the epidemic has mostly subsided in Philadelphia – just as World War I ended in Europe. On November 11, Germany became the last of the Central Powers to sign a cease-fire agreement, ending four years of warfare. And thousands of Philadelphians, once again, flooded the streets in celebration. PART TWO: For two long weeks, Philadelphia was in "the grippe" of misery.